Sometimes we ask, “What is my purpose? What can I do to make a difference?” We can keep HOPE alive; by example, by lending helping hands, by listening. We can also choose our words carefully making sure that we do not stomp on HOPE. Instead use words that give HOPE in their intention. Let me give you an example I have used before. In working with women in domestic violence relationships, we always are careful to call them survivors and never call them victims. Do you see the difference between survivor and victim? Do you see how one is HOPEful and the other stomps on HOPE. Survivor indicates someone who is in control and has power. Victim indicates someone who has no power, no control. We were born with HOPE in our life tool box. Losing it, giving it away, letting someone steal it or letting it die is kills our soul. 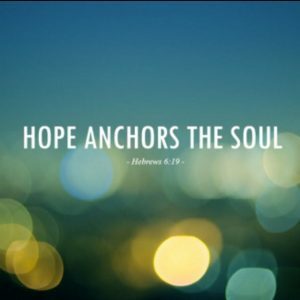 We are reminded today to not only guard our HOPE but also stoke it….breath into it…let it rise into a raging blaze. -Listening to high schoolers is so funny. Just a few snippets into conversations I heard. “Can I look at your paper?” “Sure, but I have this much (holding his index finger and thumb about an inch apart) faith it is correct. “Can I look at your paper?” “No, cheaters never prosper.” the student responds with a smile that indicated he was doing it for the other students highest good. -Catching up with Jackie, Alex and Shannon.